"Some marabouts (Islamic holy men) and imams tried to heal me, in vain. My own parents deprived me of food and I was obliged to beg from house to house. One day, as I was begging, I went to the pastor's house. He fed me, prayed for me with his whole family, and asked me to come back. He gave me food and prayed for me at every visit. At one prayer session, I confessed the Lord Jesus, and little by little the Lord healed me. Afterwards, I went back to school, and I'm now in 12th grade." Today, he is the only one from this people group who openly professes his Christian faith. His family doesn't persecute him, nor do the rest of his people. The shame they feel because they failed where the pastor succeeded stops them from persecuting him for his Christian faith. Please ask our Lord to give the gift of faith in Christ to those who hear the messages this young man has played a part in producing. May many of his family and his people worship the one true God for all eternity. The team then travelled to a different area where they stayed among another Muslim people group which has been closed to the Gospel. At first, because of the Muslim fanaticism, the team didn't reveal they were Christians. In 2004, there were five known Christians among these people. Today, there are fifty men, women and children who call Jesus Lord. It was a joy for these new converts to meet brothers and sisters who confess the same faith as them. During their time among these people the team was able to discreetly make some recordings, meet with the local pastor and give training in the use of GRN picture books and language materials. On their way home, the team stopped in another area to provide GRN materials to a local pastor and evangelise. A young woman overheard the team while they were sharing the good news with her boss. As they were about to leave she ran to them crying "come, help me, I'm overwhelmed by my problems, and I want to follow Jesus!" Down on her knees, she gave her life to Christ. 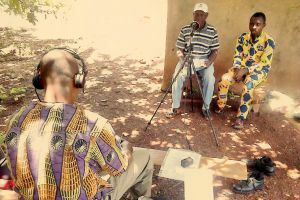 Please pray for our team in Togo as they record the good news about Jesus in the languages of that nation. Ask our Lord to enable those recordings to be distributed far and wide, for people to listen, and for God to bring many to faith as they do. Ask the Lord of the harvest to send workers into Togo, so that the entire nation might hear and have the opportunity to repent and believe.